Researchers have data crunched 2,500 recipes and found the secret to their success. Indian food, with its hodgepodge of ingredients and intoxicating aromas, is coveted around the world. The labor-intensive cuisine and its mix of spices is more often than not a revelation for those who sit down to eat it for the first time. Heavy doses of cardamom, cayenne, tamarind and other flavors can overwhelm an unfamiliar palate. Together, they help form the pillars of what tastes so good to so many people. But behind the appeal of Indian food — what makes it so novel and so delicious — is also a stranger and subtler truth. In a large new analysis of more than 2,000 popular recipes, data scientists have discovered perhaps the key reason why Indian food tastes so unique: It does something radical with flavors, something very different from what we tend to do in the United States and the rest of Western culture. And it does it at the molecular level. Why delicious Indian food is surprisingly unpopular in the U.S. I've often thought about this. Indian food has been reduced to putting color in the curry and naming restaurants as Taj Mahal. Also I feel there aren't enough meat choices for Americans in Indian food. The answer, according to Ray, likely has to do with a certain lack of appreciation for the skill required to make Indian food. The cuisine is among the most labor intensive in the world. And yet Americans are unwilling to pay beyond a certain, and decidedly low, price point. Indian food, in other words, is cheap food in the eyes of many Americans. And that has all kinds of repercussions that have stunted the cuisine's growth, at least on a commercial level. sqars , in that chart , Asian excludes indian and includes everything else asian. For example , chinese,thai,persian,afghan etc all come in Asian. If you see in that chart , only Mexican part is huge. Other single country cuisines are still small. Last edited by Napolean; March 5th, 2015 at 02:17 PM. Who can even tell difference between thai, vietnamese, chinese and japanese food? all sem sem bhaya.. if someone tells me they from Vietnam or Malaysia or Indonesia I have to go by their word, same with the food. aisa kaise ho gaya - I think I am sleepy. I should take a nap now. What are you talking about Agree about looks (though you can make a very good guestimate) but food The food is so distinctive that there is no way one can make a mistake. I cannot tell by looks if they are Chinese/Japanese/Vietnamese but food I can. I wonder why people choose mexican over indian food. 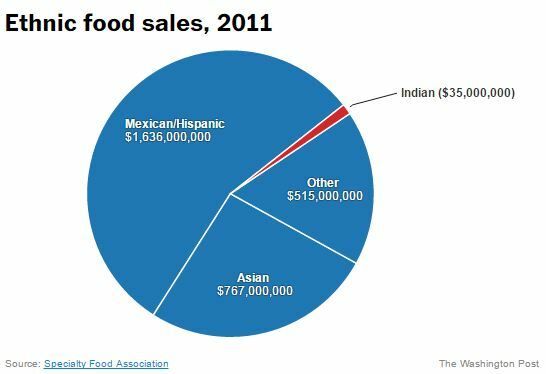 Many many more mexicans/south americans in US than Indians. Ya, drive through Indian food maybe very hard unless we are looking at making everything in advance and just do the assembly. Something like batura should take about the same time to deep fry the actual fries take. Anyways, coming back to the spend, the pie chart on spend does not necessarily show that Indian fod is 'Cheap'. example, there are 100 restaurants in a town and only 2 are Indian. suppose the total restaurant spend on the town is $25 Million and only $1 Million is spend on Indian Restaurants. it still indicates that the average spend on Indian restaurants is double that of others. I dont know about other places but where I live, Indian food is expensive compared to others. For example, for $10 you will get an excellent lunch (salad and a main). If you want the starter and a main course Indian food, you are looking at $15 to $18. Buffet is always cheaper compared to A la carte. There are very few desi restaurants that have a buffet costing more than 10-12 bucks in any US city. Now for dinner (A la carte) one can easily expect to pay 15-20 per head. Thai food is generally quite costly as well, Chinese is cheap (cheap cost and quality), Japanese food in a proper restaurant can be 20-30 per head. Thats what i was saying. The pie chart is misleading. However, the author does mention that it is difficult for restaurants to sell more expensive items. i am not sure how it works for other cuisines, because i rarely spend so much in a restaurant! Perhaps thats the problem. The Japs may spend a lot in a Japanese restaurant, but Desis would not spend a lot in an Indian restaurant. The Japs may spend a lot in a Japanese restaurant, but Desis would not spend a lot in an Indian restaurant. Not really, it would depend on the kind of restaurant you are going to. Even in Indian restaurants, there are certain places where you are looking to pay $40-$50 per person for food alone. I think it depends on the taste and the quality too. But I think I get your point. "There's a real problem on the demand side," said Ray. "People aren't willing to pay for good Indian food. If you aren't willing to pay for it, you won't get quality. And if you don't get quality, it's hard to grow. The whole system has forced a lot of restaurants to rely on less skilled workers and cooks." While it's hard to prove that Indian restaurants are employing lower skilled workers, it seems fair to assume that people aren't willing to pay beyond a certain threshold. Ray calls it the $30 dollar threshold, because Indian restaurants have a hard time selling dinners that cost more than that, even when the labor, rent, and food costs suggest they should. A perfect example of a restaurant that had trouble selling pricier Indian fare played out at Tabla, Danny Meyer's contemporary Indian restaurant in New York City, which was forced to close in 2010 after realizing that upscale Indian simply wasn't sustainable. "We fought valiantly for nearly 13 years trying to fill 280 seats with food that is tightly focused,” Meyer told the New York Times at the time. "I’ve never closed a restaurant before."